Joel Abott's surname is also spelled "Abbot", George Carey's surname is also spelled "Cary", Thomas Glascock's surname is also spelled "Glasscock", John R. Golding's surname is also spelled "Goulding", Charles E. Haynes is also spelled "Hayes" or "Hanes", and Edward F. Tattnall's surname is also spelled "Tatnall". The Georgian and the Augusta Chronicle (Augusta, GA) and Georgia Advertiser list 426 votes for Edward F. Tattnall. 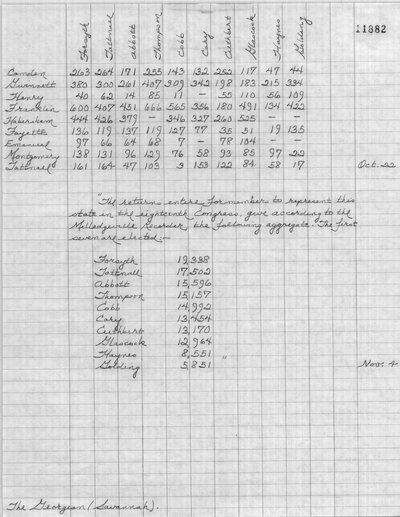 The Georgian lists a completely different set of election results for this county - Joel Abbott with 171 votes, George Carey with 132 votes, Thomas W. Cobb with 143 votes, Alfred Cuthbert with 252 votes, John Forsyth with 263 votes, Thomas Glascock with 117 votes, John R. Golding with 44 votes, Charles E. Haynes with 47 votes, Edward F. Tattnall with 264 votes, and Wiley Thompson with 255 votes. The Georgian lists John Forsyth with 633 votes. The Georgian lists George Carey with 398 votes, Thomas W. Cobb with 256 votes, and John Forsyth with 424 votes. 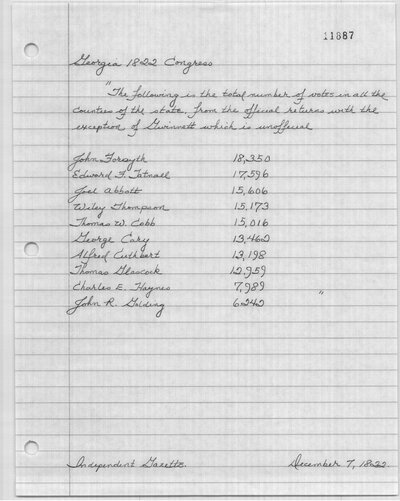 The Augusta Chronicle (Augusta, GA) and Georgia Advertiser lists Joel Abbott with 330 votes, George Carey with 375 votes, Thomas W. Cobb with 255 votes, Alfred Cuthbert with 276 votes, John Forsyth with 420 votes, Thomas Glascock with 351 votes, Charles E. Haynes with 105 votes, Edward F. Tattnall with 363 votes, and Wiley Thompson with 167 votes. The Augusta Chronicle (Augusta, GA) and Georgia Advertiser list Charles E. Haynes with 13 votes. The Georgian lists George Carey with 596 votes. The Georgian and the Darien Gazette (Darien, GA) show Alfred Cuthbert with 78 votes. The Georgian lists Thomas W. Cobb with 127 votes, Charles E. Haynes with 19 votes, and Edward F. Tattnall with 119 votes. The Georgian lists Edward F. Tattnall with 85 votes. The Savannah Republican lists Thomas Glascock with 102 votes. The Georgian lists Thomas W. Cobb with 309 votes. 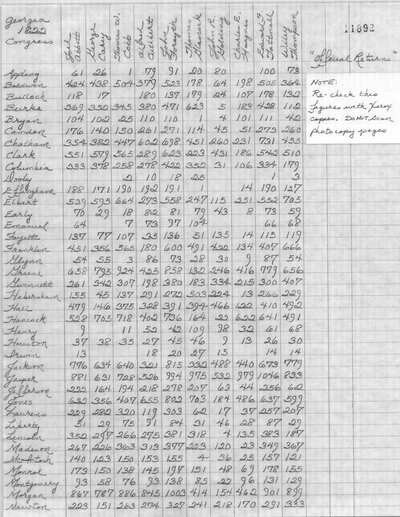 The Georgian lists Joel Abbott with 379 votes, George Carey with 327 votes, Thomas W. Cobb with 346 votes, Alfred Cuthbert with 260 votes, John Forsyth with 444 votes, Thomas Glascock with 525 votes, John R. Golding with 0 votes, Charles E. Haynes with no votes, Edward F. Tattnall with 426 votes, and Wiley Thompson with 0 votes. The Darien Gazette (Darien, GA) lists George Carey with 164 votes, Alfred Cuthbert with 378 votes, and Thomas Glascock with 364 votes. The Georgian lists John Forsyth with 726 votes. The Georgian lists Joel Abbott with 14 votes, Alfred Cuthbert with 55 votes, John Forsyth with 40 votes, Thomas Glascock with 110 votes, John R. Golding with 109 votes, Charles E. Haynes with 56 votes, Edward F. Tattnall with 62 votes, and Wiley Thompson with 85 votes. The Darien Gazette (Darien, GA) lists Thomas Glascock with 47 votes. The Georgian and the Savannah Republican list Thomas Glascock with 334 votes. The Georgian lists Charles E. Haynes with 994 votes and Wiley Thompson with only 326 votes. The Georgian and the Savannah Republican list John R. Golding with 69 votes. The Georgian lists Alfred Cuthbert with 635 votes. 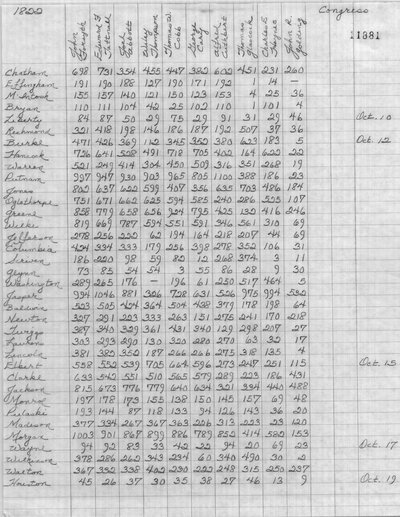 The Georgian lists Joel Abbott with 290 votes, George Carey with 280 votes, Alfred Cuthbert with 270 votes, Thomas Glascock with 63 votes, Charles E. Haynes with 32 votes, Edward F. Tattnall with 293 votes, and Wiley Thompson with 130 votes. The Georgian lists Joel Abbott with 50 votes and Charles E. Haynes with 29 votes. The Georgian lists George Carey with 266 votes and Edward F. Tattnall with 382 votes. The Augusta Chronicle (Augusta, GA) and Georgia Advertiser list Joel Abbott with 356 votes and George Carey with 292 votes. The Georgian lists Edward F. Tattnall with 334 votes. The Georgian and the Savannah Republican list Thomas Glascock with 157 votes. The Georgian and the Darien Gazette (Darien, GA) both list Joel Abbott with 96 votes and Charles E. Haynes with 97 votes. 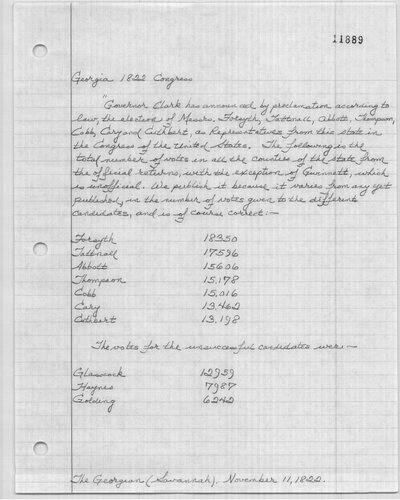 The Georgian lists George Carey with 789 votes, Alfred Cuthbert with 852 votes, John R. Golding with 153 votes, and Charles E. Haynes with 582 votes. The Georgian lists Alfred Cuthbert with 275 votes. 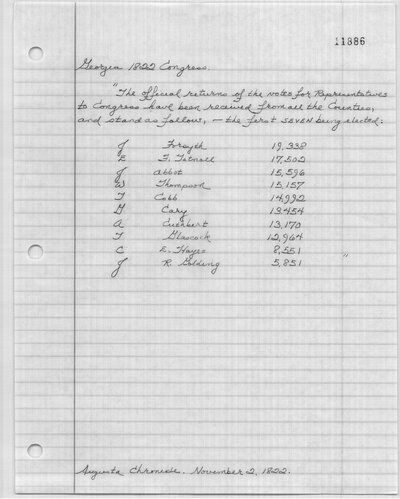 The Georgian and the Savannah Republican list Charles E. Haynes with 36 votes. The Georgian lists Edward F. Tattnall with 947 votes and Wiley Thompson with 903 votes. The Augusta Chronicle (Augusta, GA) and Georgia Advertiser lists Thomas Glascock with 386 votes, Edward F. Tattnall with 947 votes, and Wiley Thompson with 903 votes. The Georgian lists Joel Abbott with 329 votes and Edward J. Tattnall with 340 votes. The Georgian lists Joel Abbott with 338 votes. The Georgian lists Thomas W. Cobb with 450 votes and Alfred Cuthbert with 316 votes. The Savannah Republican lists Thomas W. Cobb with 457 votes, Alfred Cuthbert with 326 votes, and Thomas Glascock with 357 votes. The Georgian lists George Carey with 61 votes, Edward F. Tattnall with 265 votes, and Wiley Thompson with no votes. The Savannah Republican lists Charles E. Haynes with 446 votes, Edward F. Tattnall with 260 votes, and Wiley Thompson with 41 votes. The Georgian lists Thomas W. Cobb with 42 votes and John R. Golding with 23 votes. 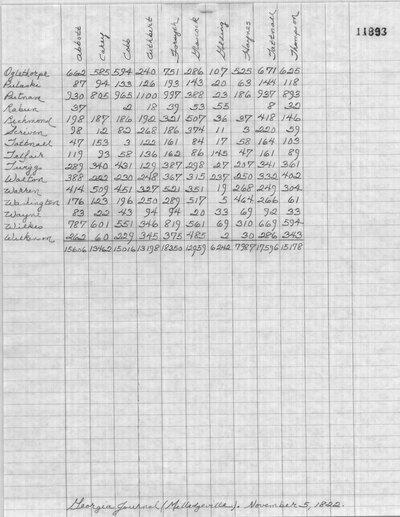 The Georgian and the Augusta Chronicle (Augusta, GA) and Georgia Advertiser list George Carey with 591 votes. 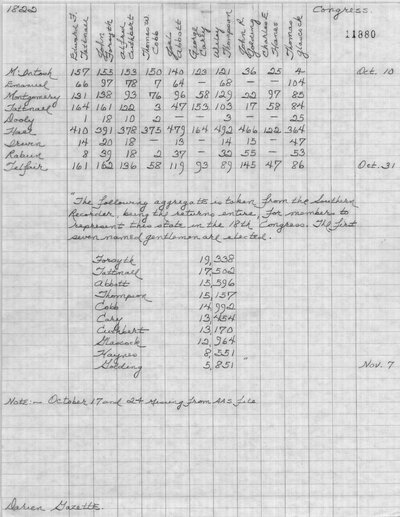 The Georgian lists Thomas W. Cobb with 234 votes, Alfred Cuthbert with 340 votes, John Forsyth with 378 votes, and Thomas Glascock with 490 votes. Augusta Chronicle (Augusta, GA) and Georgia Advertiser. October 8, 1822. Savannah Republican (Savannah, GA). October 8, 1822. Augusta Chronicle (Augusta, GA) and Georgia Advertiser. October 10, 1822. The Daily Georgian (Savannah, GA). October 10, 1822. Darien Gazette (Darien, GA). October 10, 1822. Savannah Republican (Savannah, GA). October 10, 1822. Augusta Chronicle (Augusta, GA) and Georgia Advertiser. 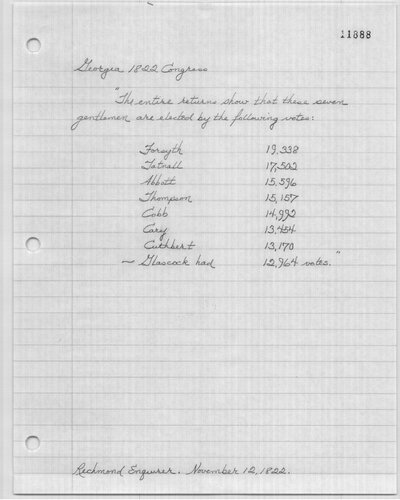 October 12, 1822. The Daily Georgian (Savannah, GA). October 12, 1822. Savannah Republican (Savannah, GA). October 12, 1822. The Daily Georgian (Savannah, GA). October 15, 1822. Savannah Republican (Savannah, GA). October 15, 1822. Southern Recorder (Milledgeville, GA). October 15, 1822. The Daily Georgian (Savannah, GA). October 17, 1822. Savannah Republican (Savannah, GA). October 17, 1822. The Daily Georgian (Savannah, GA). October 19, 1822. Savannah Republican (Savannah, GA). October 19, 1822. The Daily Georgian (Savannah, GA). October 22, 1822. Savannah Republican (Savannah, GA). October 22, 1822. Southern Recorder (Milledgeville, GA). October 22, 1822. Southern Recorder (Milledgeville, GA). October 29, 1822. Darien Gazette (Darien, GA). October 31, 1822. Augusta Chronicle and Georgia Advertiser (Augusta, GA). November 2, 1822. The Daily Georgian (Savannah, GA). November 4, 1822. Savannah Republican (Savannah, GA). November 4, 1822. Georgia Journal (Milledgeville, GA). November 5, 1822. Darien Gazette (Darien, GA). November 7, 1822. Washington Gazette (Washington, DC). November 9, 1822. The Daily Georgian (Savannah, GA). November 11, 1822. Richmond Enquirer (Richmond, VA). November 12, 1822. The Knoxville Register (Knoxville, TN). November 19, 1822. Independent Gazette (Franklin, TN). December 7, 1822.